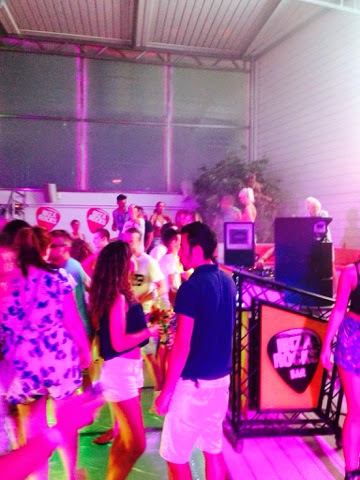 The flight to Ibiza from Madrid was extremely short, about 50 minutes take off to touch down. The slew of people on my flight indicated that this was about to be a party-heavy weekend. 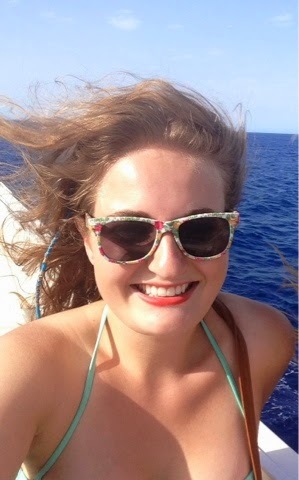 I caught a cab to my hostal, hostal Flores, located on the iconic, party central west end of the island. If you don’t mind spending a little more on lodging, however, the friends I met up with were staying in the red hotel in San Antonio, just as fabulous a location but with an ocean view, wi-fi and a few more amenities, they spent about 50 euros a night for their room. The first night we went out to the bars on the west end, an overwhelming and extremely fun experience. 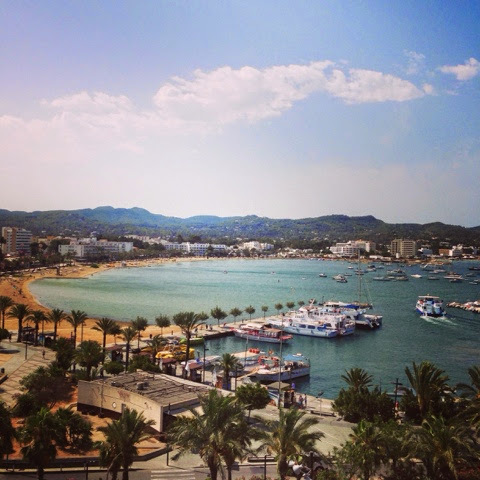 The thing I quickly learned about ibiza is that in order to really enjoy the experience, one must let go of the idea of saving money or doing anything cheaply. It’s not possible. Everything costs money and it’s all pretty expensive, but there are ways to get decent deals in order to have a good experience. 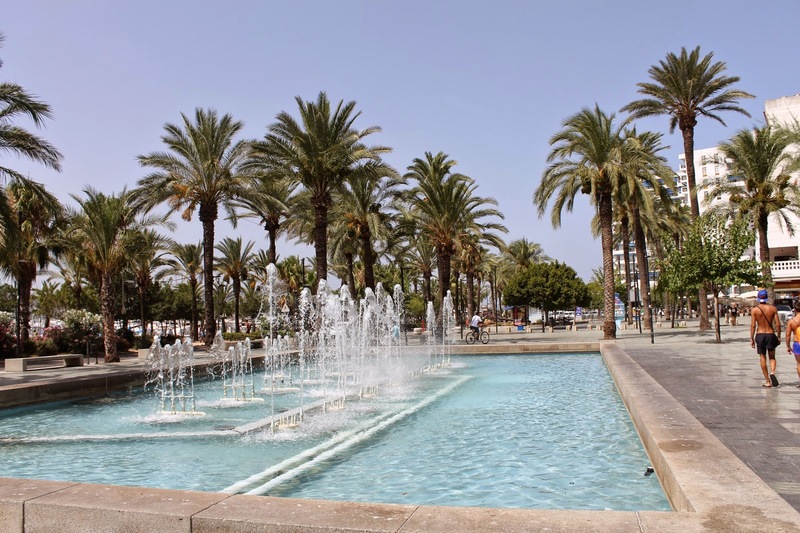 After just three nights and two full days, I am far from an expert in “how to Ibiza” but I did learn quite a few things while being there that could be helpful for someone looking to plan a quick beach getaway. “The Iconic West End” is a long strip of bars, restaurants and nightclubs (and strip clubs) located just off the water in San Antonio. The streets look like absolute carnage. 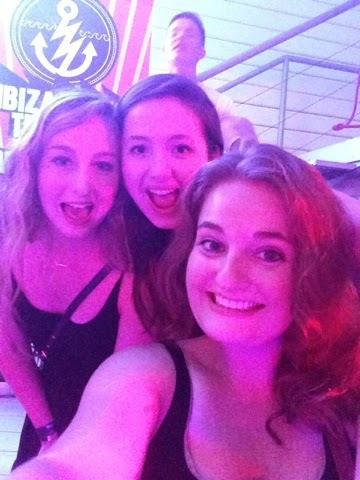 Our first night in Ibiza we stayed up until 4:30AM out on the West End, jumping from bar to bar. 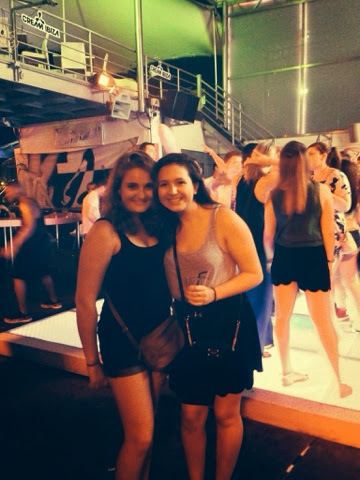 It was a super fun experience, the drinks are a little pricey, but it is a good way to go out and have the dance/club atmosphere without dropping 30+ euros on the cover charge for the larger clubs. The bars that we went to included 80s/90s bar which played tons of great throwback music, Ground Zero which was a cool indie-rock bar, Cafe mambo among many others. Drinks average 4 euro each, and shots are about 2-3. 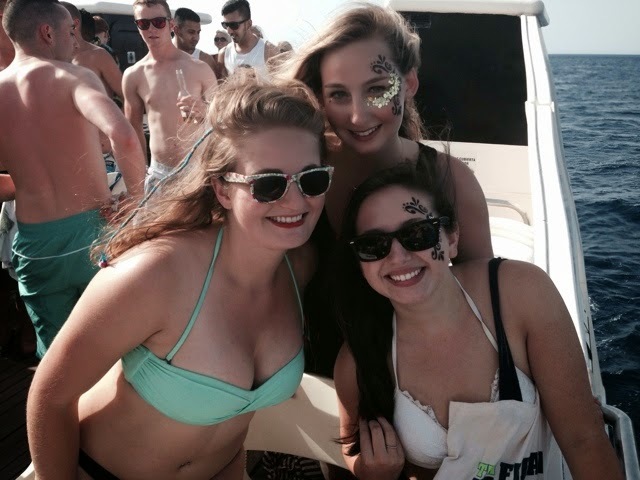 Not horrible if you spend time pregaming beforehand. As far as attire, I quickly learned that literally, ANYTHING goes in the west end. Club and bar attire ranges from fancy to just plan trashy-scandalous. Aside from drinking and dancing, time in the West End is also well spent just people watching. 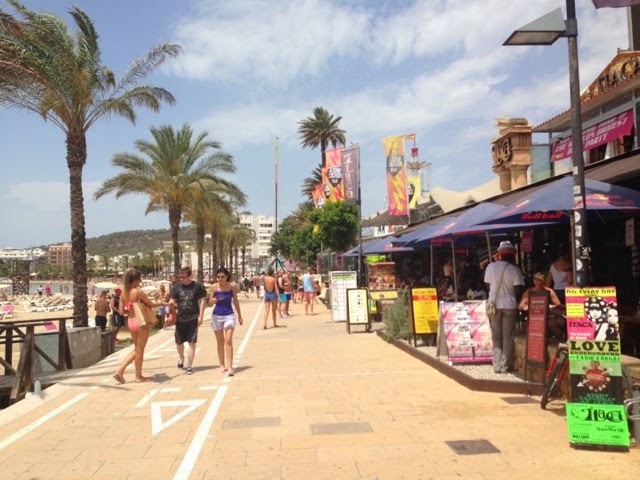 Located right on the waterfront, Ibiza rocks is a very touristy, club-atmosphere bar that has connections to do party packages in Ibiza. We ate here multiple times and had drinks, as it is a nice atmosphere and the drink prices are not outrageous. Later into the evening as the bar fills up, with the live DJ playing music, it is almost as if it is a free club, there is dancing and drink specials all night. 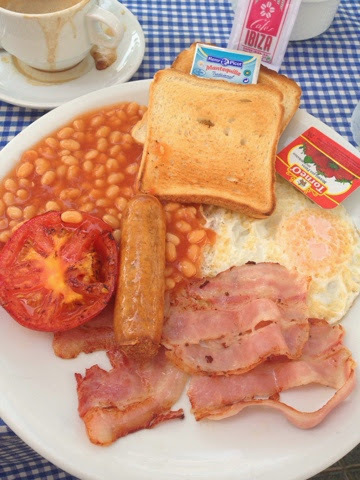 I would definitely recommend a visit to Ibiza rocks, either at night to enjoy some of the nightlife or during the day to chill out with some hangover food or day drinking. 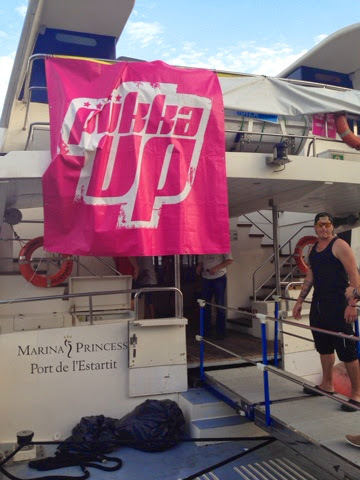 Pukka Up was the company that we bought our boat party package from. 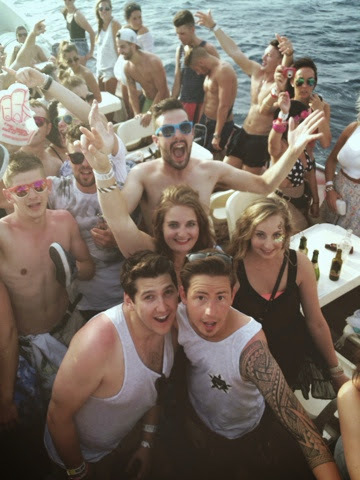 For 70 euro we got entrance to gatecrasher, a massive nightclub in San Antonio, three hours on a boat booze cruise with live DJ, cruising around the Mediterranean, access to Ocean Beach club the next day and better deals on drinks at the Ibiza rocks bar. 70 euro is a lot of money to spend, but it was a super fun experience, and a three hour boat cruise is a good amount of time to be out on the water. The cruise goes from 5-8pm which was nice because it avoids the blistering heat of midday. Free entry to Ocean Beach was a cool perk, as we got to see a ritzy beach-side club, but be warned that free entry does not mean that you wont be spending money once inside. Just a chair to sit on runs up 10 euros and the food and drink prices are completely ridiculous. Privilege nightclub is the largest nighclub complex in the world, located about 10 minute bus ride outside San Antonio. On our last night we happened to stumble upon a girl who was handing out wristbands for free entry and free transport to and from the club. 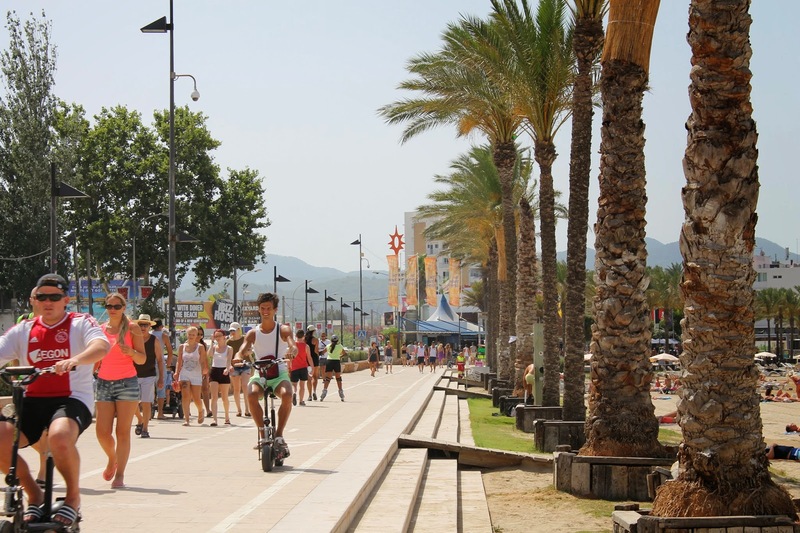 An obvious attractive factor about Ibiza for many people under the age of 40 is the prospect of partying under the influence of psychoactive drugs, namely MDMA (molly) and other similar rave drugs. 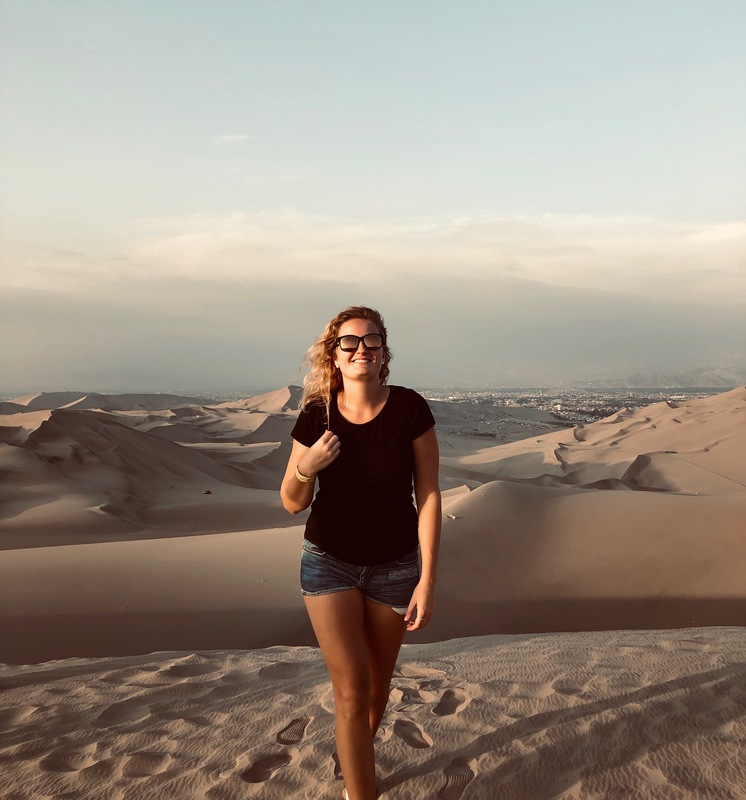 It’s fairly obvious that many people do them while vacationing to enhance their club experience, and my two friends and I were even offered what I assume was Molly our first night while getting drinks in a bar, to which we politely declined. If you want to do them, they are definitely available from the various club promoters and other seasonal workers. A stripper from Belfast, Ireland that I had a nice conversation with at 4am informed me that selling drugs is the way that most of the workers from the UK make more money during the work season in Ibiza. If you want to do them, they are definitely available, just be warned that the local police forces have caught on to this trend, and on our first night, there was a major drug raid at a bar that we were drinking at, and everyone was searched on their way out, including myself. For a decent priced meal and free wifi, as well as a nice location, I hit el patio de los fuentes multiple times during my weekend stay. The staff was super friendly and having fast, free wifi was essential considering hostal flores does not have it. I had pizza from here as well as a full on English breakfast, which was only 4.50 and sustained me for a good chunk of the day. Big mugs of beer were only 3 euro, which is very reasonable considering how expensive drinks were in the area. 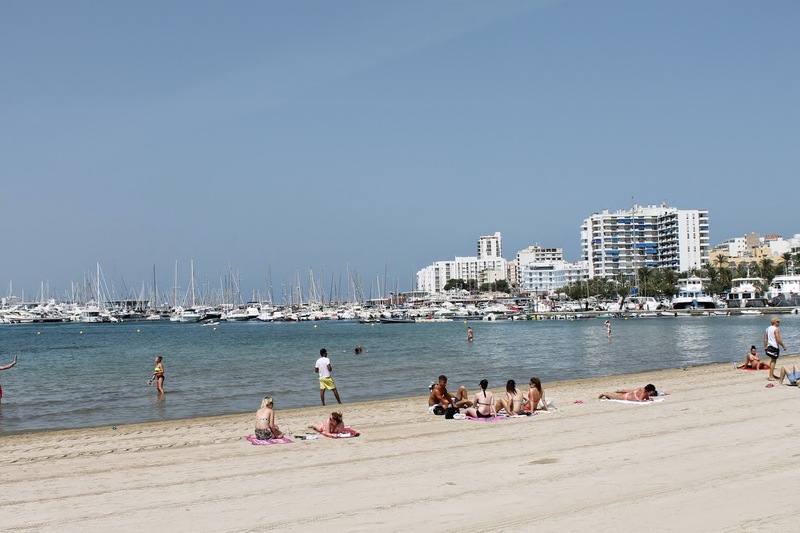 Obviously, the best free thing to do while in Ibiza is to head to the beach. The beach is San Antonio was very pretty and fulfilled my longing for the ocean, but if you have sufficient time I would recommend venturing to other parts of the island as well. 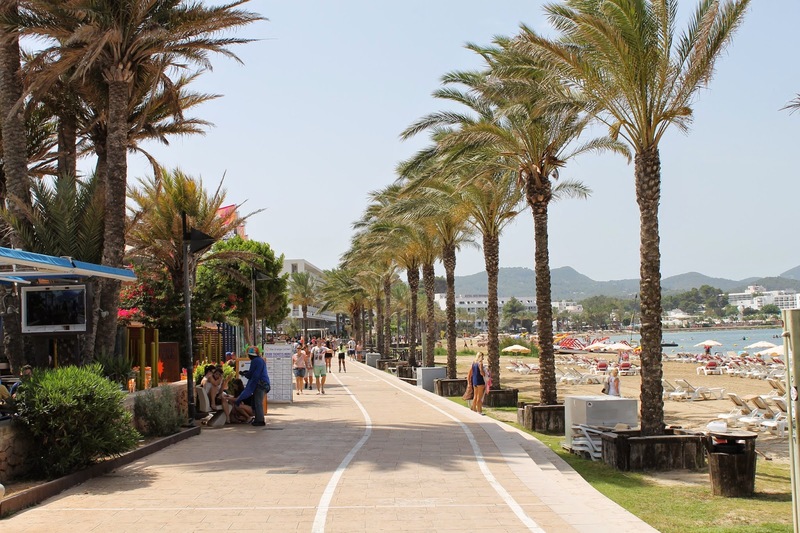 Buses run from the station in San Antonio to other nearby beaches that are beautiful and less crowded. 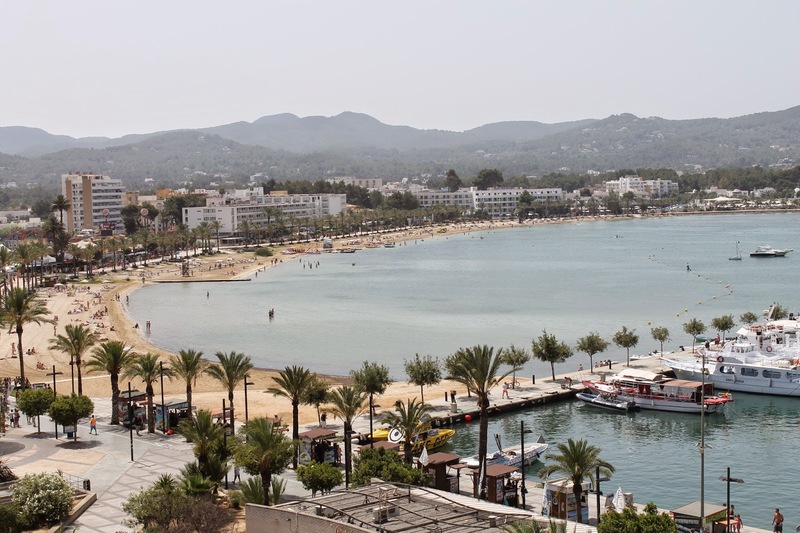 The 7 runs from the station to Cala Bassa beach, the 4 to Platges de Comte and the 5 to Cala Tarida. 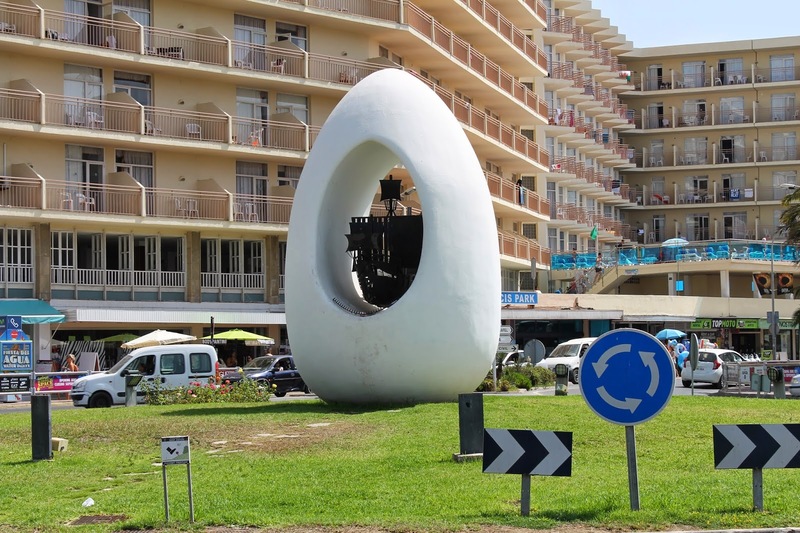 Ibiza offers a huge host of things to do besides just partying and relaxing on the beach. Parasailing, paddle boarding, scuba and snorkel, among many other water sports and activities are very popular here, but if I am being honest, I didn’t partake in any of them. Besides being tired both days from traveling and partying, the activities are fairly expensive when compared to prices of the same activities in other places, so I decided to skip it and save it for when I go to Mexico (hopefully) in the near future. The amusement park. Just don’t do it. Overpriced and nothing special. 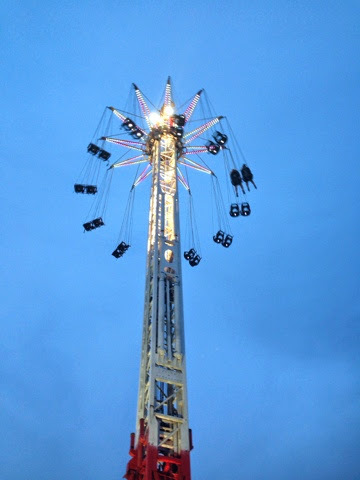 This picture is kind of cute because the only two bodies on the ride are me and my friend Elizabeth, but it was 10 euro and I felt like ralphing afterward. 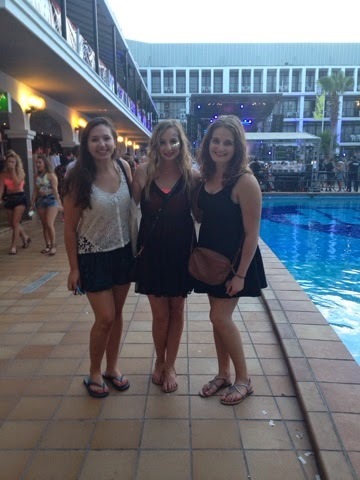 Overall, Ibiza was a very fun, entertaining experience, a great way to party and chill out before finals week for my summer classes. I’m not sure if I would go back, I definitely want to go to the other Balearic Islands, Mallorca and Menorca for the beautiful beaches without the trashy party chaos. 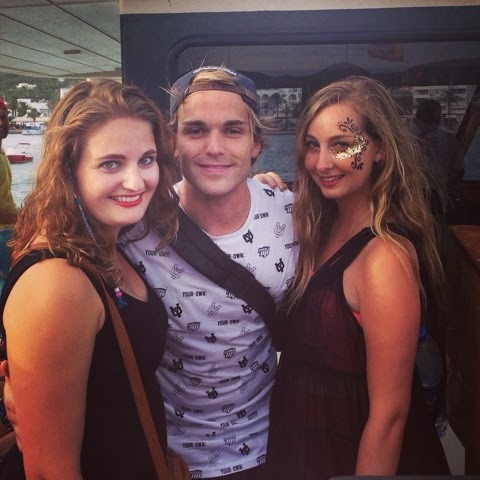 Maybe Ibiza again someday when I have unlimited funds to spend on having fun. It also cultivated within me a newfound love for EDM or electronic dance music. I can’t stop listening to david guetta, tiesto, avicii, hardwell and several others, I’ve been dancing on the street and on the bus ever since getting back. It looks like an amazing time away! 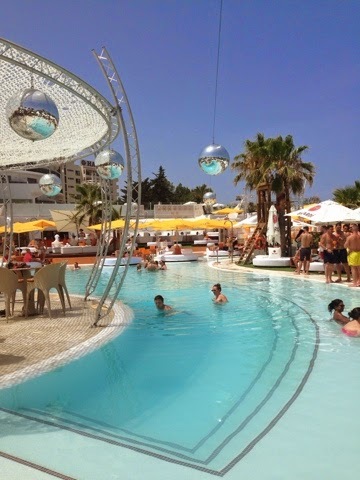 I went to Ibiza a few years ago but not to the party area, it looks fab! It was really fun! I would love to go to the non-party area someday for a more relaxing getaway! Love your blog!! Great post. 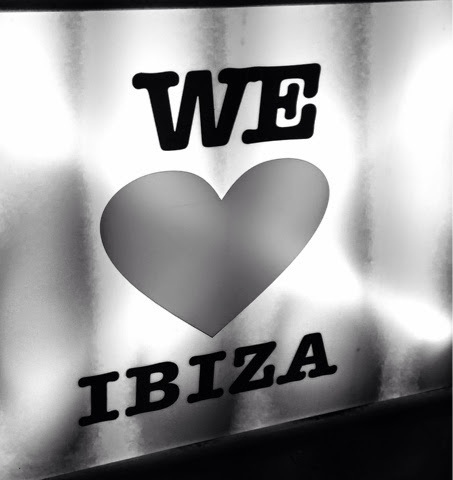 It's made me miss Ibiza! I've been loads of times but not recently.